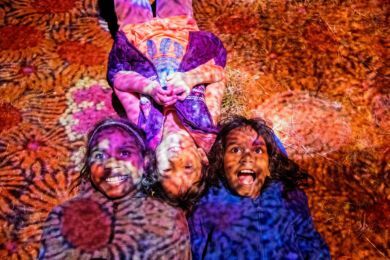 Delightful image of kids enjoying themselves at the inaugural 2016 Parrtjima Festival. The NT Government has announced the appointment of Rhoda Roberts AO as curator of the second annual Parrtjima – A Festival in Light event in Alice Springs, running from Friday, 22 September to Sunday, 1 October 2017. 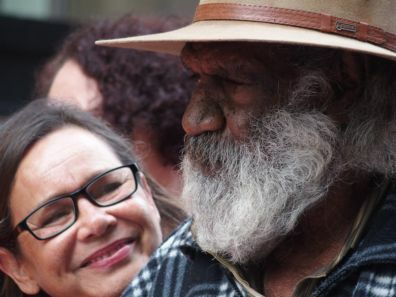 Roberts has a high-profile nationally and internationally as a respected Indigenous creative director, writer, producer and is a member of the Bundjalung nation, Widjabul clan of Northern New South Wales and South East Queensland. She is also Head of First Nations Programming at Sydney Opera House, Festival Director of Boomerang at Bluesfest and was Creative Director of the Vivid Sydney Opera House Sails Projection in 2016. Andrew Hopper, General Manager of NT Major Events Company, said Roberts will work closely with the Parrtjima Festival Reference Group, AGB Events, local Aboriginal artists and 40 art centres from across the desert region to develop the narrative for the 10-day event that celebrates the magnificent Aboriginal art of Central Australia. “Rhoda is one of Australia’s most accomplished Aboriginal arts consultants and creative directors. 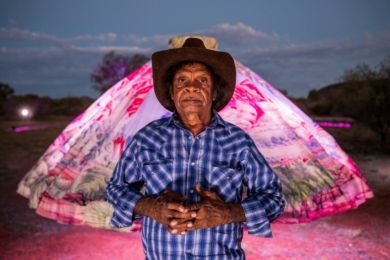 Her extraordinary breadth of experience and understanding of the consultative process will be invaluable as we build meaningful connections with local artists to create a breathtaking outdoor exhibition of Aboriginal art,” Mr Hopper said. Among her achievements, Roberts was Director of the first Sydney Olympic Games Festival of the Dreaming in 1997, Creative Director of the Awakening Segment at the Games Opening Ceremony, Director of Sydney New Year's Eve (2008-2011), host of Deadly Sounds national weekly radio program (1992-2014), producer of Aboriginal media company Vibe Australia (1992-2014) and co-founder the Aboriginal National Theater Trust.